The Pavlovsk Palace and park ensemble is located 27 kilometers away from St.Petersburg. Pavlovsk Palace was the favorite summer residence of Paul I, son of Russian Empress Catherine II, who gave him this lands as a present. The Pavlovsk Palace was built in 1779. It’s interiors were decorated to the tastes of Paul I and his wife Maria Fyodorovna. British architect Charles Cameron spent over twenty years of his life to create the Pavlovsk ensemble. His work was continued by the architect Brenna. The Pavlovsk Park, one of the biggest parks in Europe, is beautiful and peaceful. It preserves the spirit of Russia. 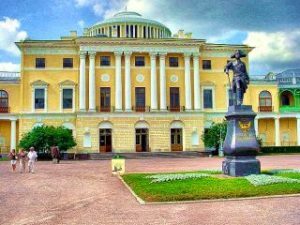 From it’s very beginning it was laid as an English landscape park, therefore it is different to the French regular gardens in Peterhof and Tsarskoe Selo. Pavlovsk park is very poetic, and resembles a forest, with lots of trees, huge fields, small rivers and several pavilions spread over this great territory. The Pavlovsk Park is one of the precious pearls of the world landscape art. This excursion is not available on Fridays.